At this event KineMatik will officially launch the OpenText Business Application Builder for xECM. This tool enables us to configure Content Suite Connected Workspaces, according to a customers’ user requirements, for any business process. The family of OpenText Quality Applications by KineMatik for xECM continues to expand and now includes Audits, Change Control, CAPA, Complaints, Document Change Control, Equipment Register, SOP Training and more. The latest version of these Quality Applications has a host of new features including new configuration capabilities to edit Form Views and Registration Pages along with major improvements to the User Interface. OpenText Project Management for xECM by KineMatik extends the project functionality to Connected Workspaces. This allows Projects to be related to other workspaces such as Contracts or Programs. This provides a method for Related Workspaces to display project summary data ensuring that Program and Contract Managers can visualize the information they need to perform their duties. The solution now also includes a set of perspectives for Programs, Projects and Launch pages ensuring that users can intuitively find the information they need. The OpenText Form Builder for xECM by KineMatik, which enables any Content Suite user to create and edit professional Form Views without the need of developer expertise, goes from strength to strength. It is now available as a stand-alone product, as well as part of the Quality Applications and supports more attribute types (Table Key Lookups and ADN Attributes) and increases user adoption. 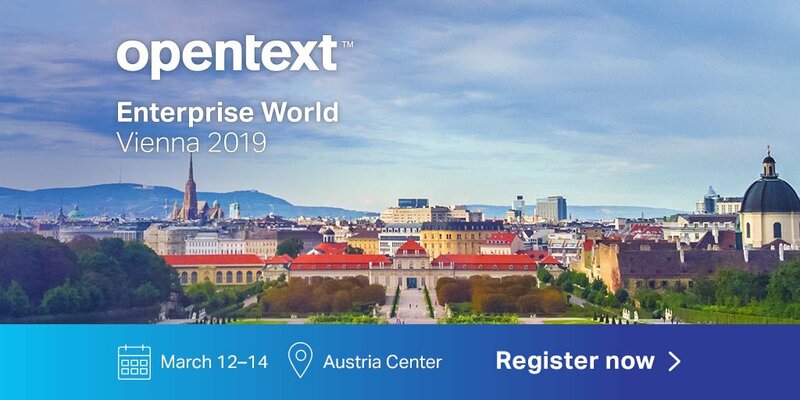 Come visit the KineMatik stand at Enterprise World Vienna at booth #120 and discuss the opportunity to run a pilot with any of the KineMatik solutions. If you would like to pre-arrange a demo, contact KineMatik on info@kinematik.com and we will set up a time.